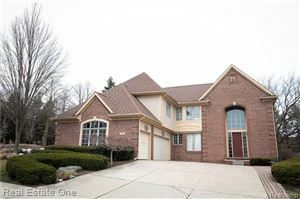 Wonderful location and large lot in the heart of Rochester Hills!! 3 Bedroom, 2 full bathroom brick Ranch situated on a corner lot, with a finished basement that has a large recreation room, Bar, ceramic tile flooring & full bathroom perfect for added entertaining space! This home has a newly renovated bathroom, fresh paint, huge Living Room, wood floors, Oak cabinets in the kitchen, new HWH, Large fenced yard with a 2 car garage and additional large space for boat or RV storage a plus!! Close to expressways, shopping & dining. Must see & make this yours.Move in ready. Immediate Occupancy. Award winning Avondale schools.